Monday morning we were running around the splash pad dripping with sweat. Tuesday morning we were hanging on to the sides of our homes, trying not to fly away Wizard of Oz style. I’m learning that this is how the weather in North Dakota works. It can change on a dime. It can be beautiful and it can be ferocious. We had winds up to 90 mph. I posted a message on Watford City’s facebook page – Watford City Whatz Up?!! – asking people for pics of the storm. I got such a big response I have to showcase them here. Keep in mind that all of these pictures are from the same storm. The sky is so dynamic and dramatic. Crystal Banks took some pictures just east of us in Mandan, ND, all of these pictures are as is – no filter or editing! My favorites were the pictures of some of the destruction around town hehe. But really, this sky is crazy right? I’ve never seen anything like it. I survived my first big summer storm. I did not end up in Oz. I will put those two things on my “stuff I accomplished this summer” list. Thanks for the pictures my Watford friends. 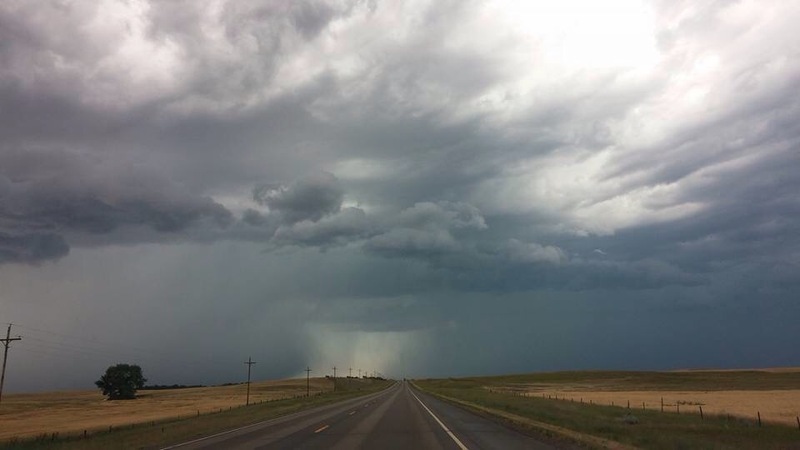 This entry was posted in NoDak Livin, Oil Boom and tagged North Dakota Storm, summer storm by bebadoozie. Bookmark the permalink. People really should talk about the sky more. It’s an attraction almost unto itself. I don’t know if you’ll ever see bluer skies – set against the beautiful colors of the prairies – it seems you can see forever. And at night – billions of stars. Thank you for sharing our beauty! I have been enchanted with this sky! An unexpected perk! It may sound strange, but one of the main things I miss about the plains are the storms. There is nothing like the power of an afternoon summer thunderstorm and the calm, clean air after it has passed, the sun is back out and the birds are chirping again. Nice post with some cool photos. I’ve never experienced anything like these storms before, I can see how you would miss them if they were your norm growing up! Sort of enchanting.